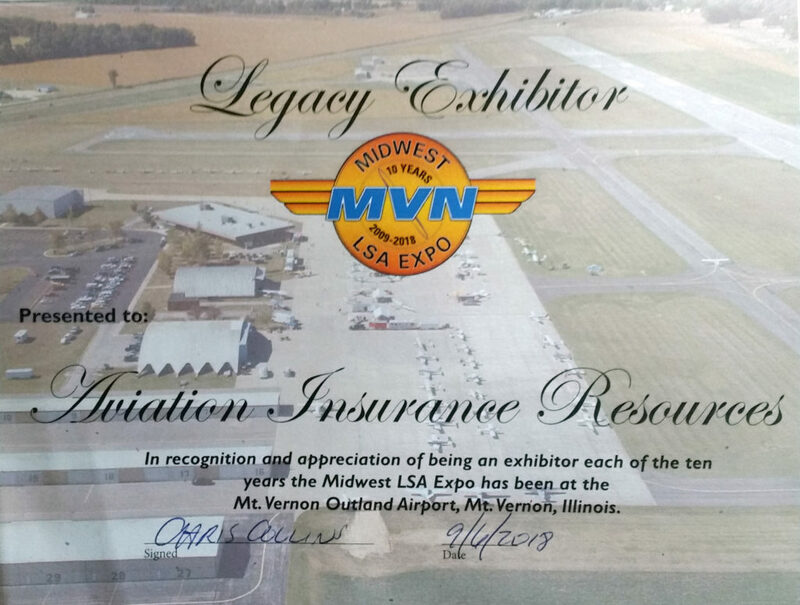 Last weekend, Aviation Insurance Resources (AIR) was recognized as a Legacy Exhibitor at the Midwest LSA Expo. AIR has exhibited at this light sport expo continuously since its inception in 2008. Over a decade ago, AIR was the first paid exhibitor at this annual event at Mt. Vernon Outland Airport in Mt. Vernon, Illinois. This free annual event includes over 30 exhibitors; however, this year’s weekend was mostly rained out. While attendance was lower than average, and many exhibitors could not make it in due to weather, AIR agent Gregg Ellsworth prevailed. Gregg made the most of his time at the show, speaking with attendees about their LSA aircraft and their aviation insurance needs. Fingers are crossed for a dry and crisp Midwest LSA Expo for the 11th year in September 2019! You can count on AIR to be there once again, rain or shine! For more information on the Midwest LSA Expo or to get a quote on your Light Sport Aircraft call Gregg at 301-682-6200 or request a quote online today! PreviousPrevious post:T.H.E. Continues to write Lighter than Air Insurance through New PartnershipNextNext post:How Only $20 can Double your Aircraft Renter Insurance!